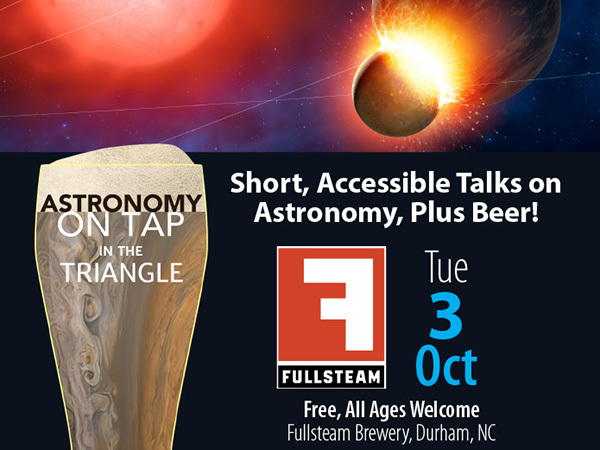 Presenting the second event of Astronomy on Tap Triangle, our North Carolina chapter of short, engaging talks about astronomy over beer! Our events are free and open to all ages, held at the taproom of Fullsteam Brewery in Durham, NC. 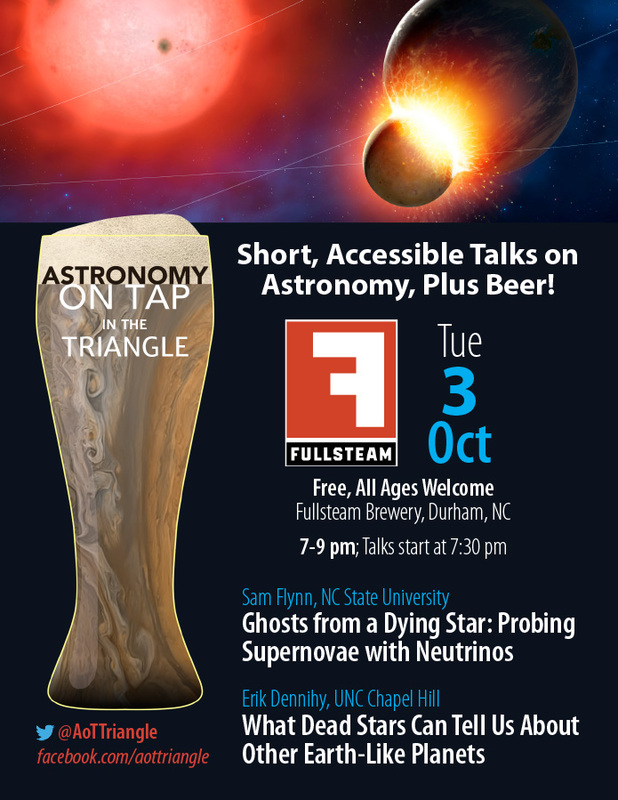 On Tuesday October 3, we’ll hear all about dying stars from two professional astronomers in the Triangle. First we’ll hear from NC State graduate student Sam Flynn*, who will talk about faint ghost particles called neutrinos emitted from supernovae, the violent, explosive end to massive stars. Then we’ll be joined by UNC Chapel Hill graduate student Erik Dennihy**, who will tell us what dead stars can tell us about Earth-like planets around other stars in our Galaxy. *Sam Flynn is a fourth year Ph.D graduate student at NC State University working with Dr. Gail McLaughlin. Sam’s research explores the effects of neutrino oscillations in astrophysical environments, in particular investigating the effects of non-standard model interactions on neutrino signals from supernovae. A native of Charlotte, North Carolina, Sam earned a B.S. in Physics from Wake Forest University. **Erik Dennihy is a graduate student at UNC Chapel Hill in his final year of a Ph.D. in Astrophysics with Chris Clemens. Erik’s research focuses on the variety of precision instruments astronomers use to capture the night sky and the remnant exoplanetary systems that are left behind after the death of their host star. He obtained a B.S. in Physics from the University of Georgia. ← AoT Aarhus launches on Tuesday, September 19!